Build workflows, including dual parallel workflows, using our newly improved workflow editor. Workflow editing in Mintent has been redesigned and improved to include drag and drop functionality for more flexible creation, as well as the ability to create dual parallel workflows. The design and functionality of workflow navigation within creative brief items has also been changed slightly to accommodate the new parallel capabilities; however, non-parallel workflows will continue to function as they have in the past. Lastly, the Actions options within Lists>My Tasks within Mintent will also change to accommodate items using parallel workflows. 1. Navigate to Settings>Workflows and click the +New Workflow button. 2. Give your new workflow a unique name and click Enter. 3. Select the workflow Owners, Owners Limit and designate whether or not the workflow will be a Stretch Event. Owners - limit workflow ownershop to a specific user(s) so that when an item is created using this workflow the default owner will be specified. Owners Limit - define owners from a specific list of users with specifics role or group of users. As an example you may designate the role "Admin" as the default Owners Limit so every time a new item is created you can only choose from users in the Admin group. 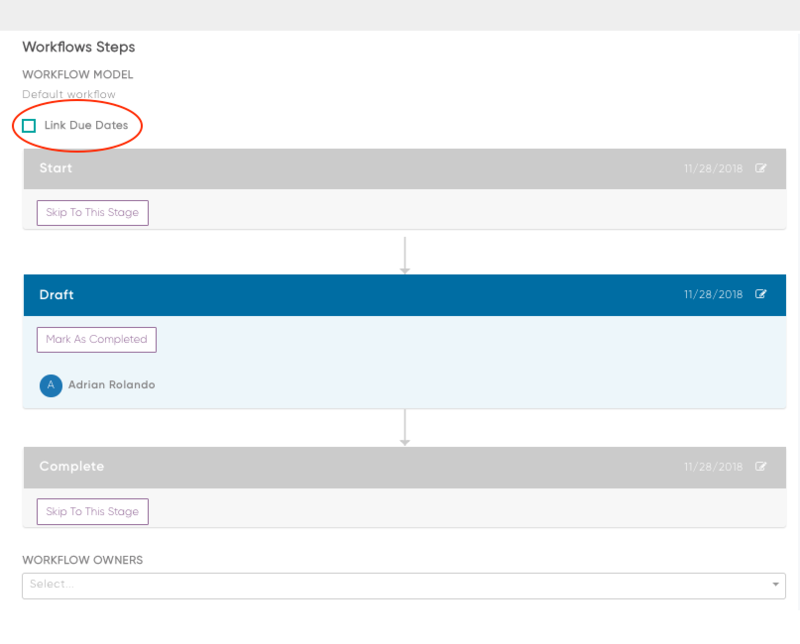 Stretch Event - items which stretch out across multiple days within the Calendar view. 4. Drag and drop a Working, Single Approval or Multi-Approval Stage Type into the Workflow Editor. 5. Click the wrench icon associated with any stage to adjust the configuration of the stage including Name, Stage Type, Assignee Defaults (default users assigned to a stage)/Limits (limited list of user who can be assigned to a stage), Description and any Special Instructions. 6, Continue this process of adding stages above, below or beside each other to define your desired flow. NOTE: Only two parallel branches can currently be accommodated. 7. Once a workflow has been created it can be associated with an applicable Content Type(s). 1. Link Due Dates selection has been moved from the Complete Stage at the bottom of each workflow to the top of each workflow as Linking Due Dates can an important component of setting up and managing parallel workflows. 2. 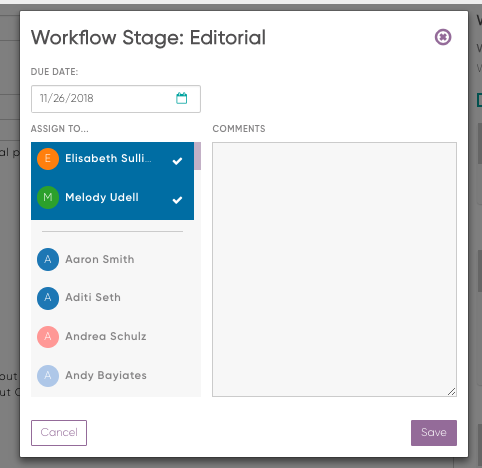 Workflow Stage Editing is now completed via a popup window where Due Dates, Assignees and Comments can be added or adjusted as needed. 3. Requesting Revisions within a branched parallel workflow will reset the entire branched flow if those revisions are required in a stage prior to the branch. Users will receive the following warning if they attempt to submit these types of requests "This action will undo the other branch's progress as well. Do you want to proceed?" Creative Brief items with parallel workflows will appear multiple times in List>My Tasks to accommodate the Actions (i.e. Mark as Complete or Request Revisions), which may be taken in parallel branches. Please reach out to support@getmintent.com if you have any questions about how to use and/or take full advantage of this new feature.